I have not posted this recipe before because I can't make it for you...thus giving you the opportunity to taste it without going to the effort of making it yourself. I can only ask you to trust me when I say that this is a seriously elegant and delicious dessert. It is sweet...but sophisticated—definitely a dessert for grown-ups. I love it all by itself...with maybe a little bit of mascarpone whipped cream...and perhaps a platter of biscotti. 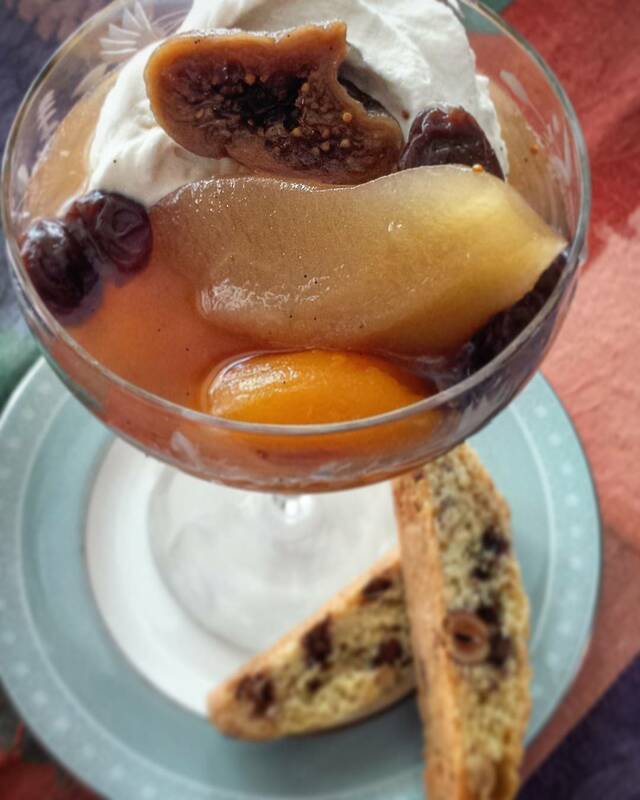 If you have never poached fruit, you should give it a try—it is an easy technique to learn. I wrote a basics post on how to poach pears (for a tart) a few years ago. The recipe I'm posting today uses the exact same method to begin. 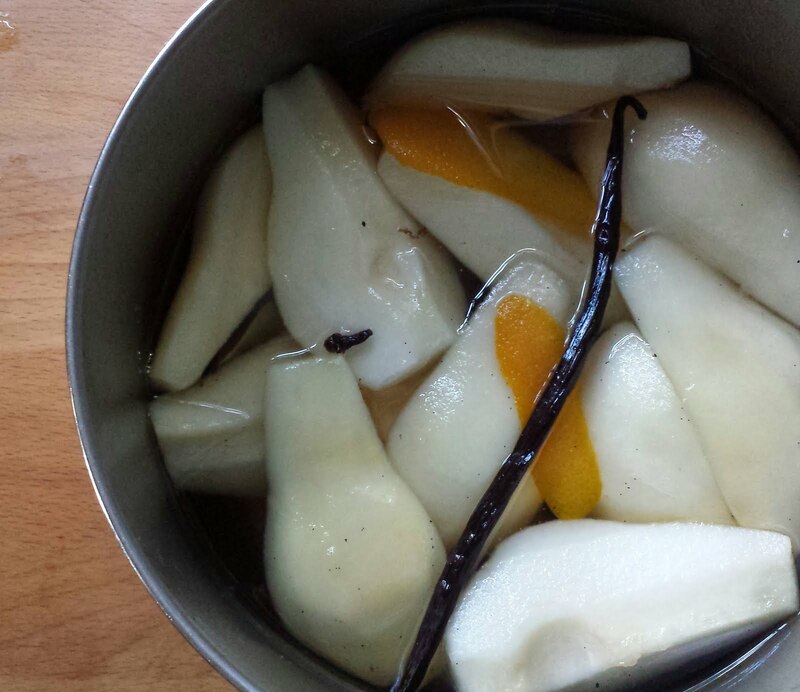 Then, after the pears are done, the dried fruits are steeped—and plumped—in the poaching liquid. They add rich flavor and beautiful color. 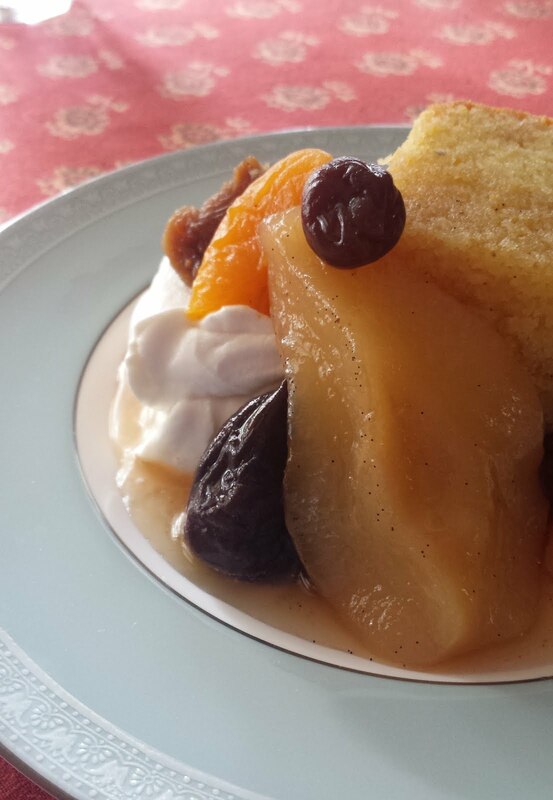 Depending on the ripeness of the pears (and thus how long you have to cook them), you may need to reduce the poaching syrup by simmering briefly after all of the fruits are finished. But be careful not to overdo it. The final syrup should be a light and fluid nectar—perfect for sipping from a spoon...or for dunking those biscotti. Once you try this recipe, you will want to make it for your friends and family. If you feel the need to tempt people into sampling it, serve it with a slice of pound cake (everyone loves pound cake). Any good pound cake will do, but I'm particularly partial to an Italian one—Amor Polenta—that I posted a few years ago. 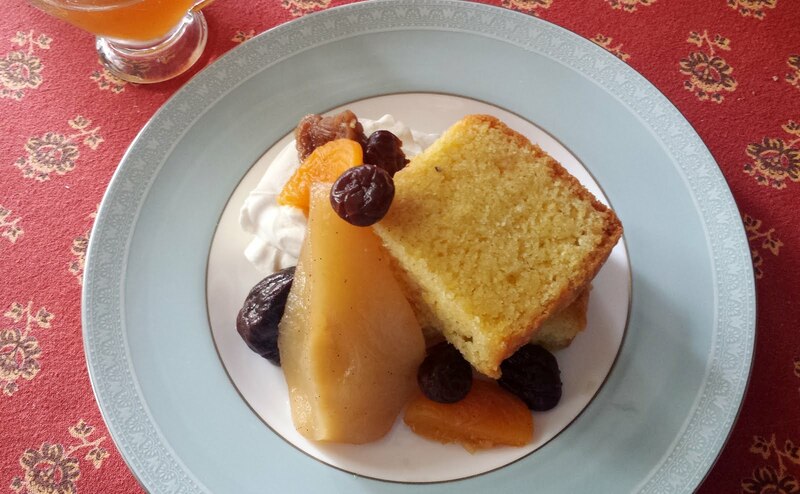 The almond and cornmeal are a fantastic match for the pears and dried fruits. You can tell your guests that the fruit is a garnish. Once they taste it they will realize that in this case the cake is definitely the supporting player...and the fruit is the star of the show. In a saucepan large enough to hold all of the pears, combine the wine, 3 c. water, sugar and flavorings. Bring this to a boil and simmer for 5 minutes. While the poaching liquid cooks, cut a round of parchment that is slightly larger than the pan and cut a hole in the center (this will act as a "lid" and help keep the fruit fully submerged in the liquid—it is called a cartouche). When the syrup is ready, add the pears, press the parchment round to the surface of the liquid, lower the heat and barely simmer until the tip of a knife will go in and out without resistance. Cooking time varies greatly depending on the ripeness of the pears—start checking after 10 minutes for very ripe pears. Using a slotted spoon, transfer the pears to a platter. Return the poaching liquid to a simmer and add the dried fruits. 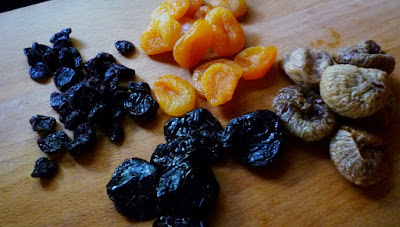 Simmer gently until the dried fruits are tender (they will soften and some will swell slightly)—5 to 10 minutes or so. Depending on how ripe the pears were the liquid may need to be reduced a bit. If you would like to reduce the poaching liquid at all, lift out the dried fruits and add them to the plate with the pears. Return the poaching liquid to the pan and simmer until it has thickened slightly (but no thicker than maple syrup...or a dessert wine). 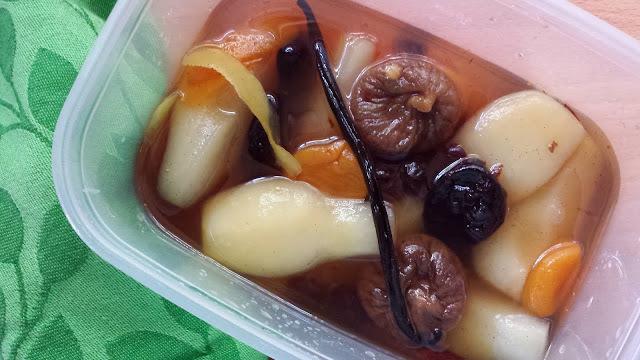 Remove the pan from the heat and return the pears and dried fruits to the pan of poaching liquid. Cool and store the pears and dried fruits in the poaching liquid. Serve the compote chilled. Remove the vanilla bean, cinnamon stick, cloves and zests before serving. I like to halve the figs lengthwise before serving to expose their lovely interior. If the prunes and/or apricots are especially large, you might consider halving them as well. Whether I am serving this as a stand alone dessert—or to accompany a slice of cake—I like to serve it with mascarpone whipped cream sweetened with some of the poaching liquid (see below). This is so true. When I took this class, I was not excited (initially) about this dessert. Then I tasted it, and purchased the ingredients to make it on my way out the door. Its been a couple years since I've had it. I think I need to make it again soon. It made me so happy to hear this! Thanks for letting me know!